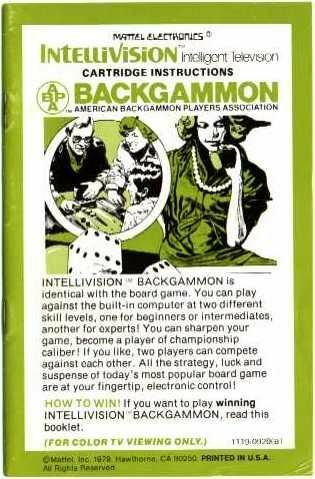 ABPA Backgammon | Welcome to the Intellivision Revolution! 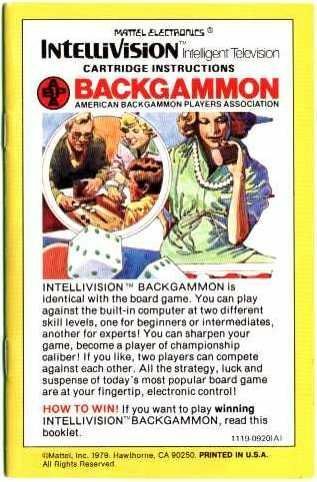 PRESENTED TO YOU BY INTVFUNHOUSE! 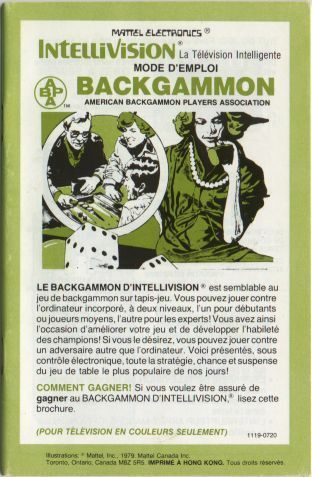 Backgammon was one of those early games that was initially released with full color documentation, as well as overlays displaying the American Backgammon Players Association (ABPA) logo. 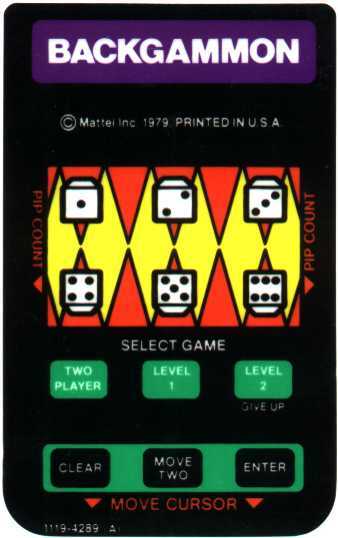 The sound used for the computer's "thinking" is the same as the one used in Checkers. 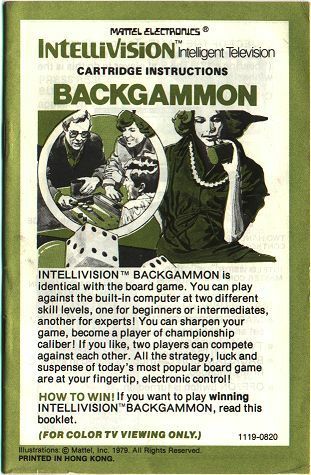 It's a fine game, and I really do enjoy the traditional board game, but why make it into video game? 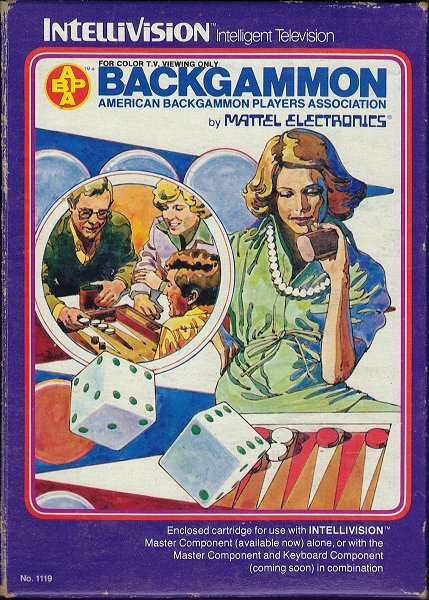 Sure, you can play even when you can't locate a live opponent, but come on! 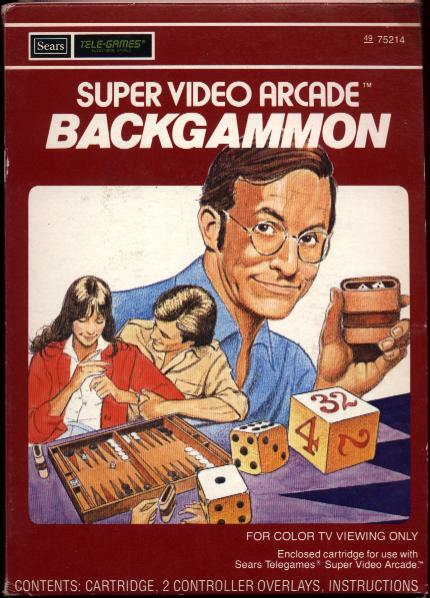 We're talking a video game console here! 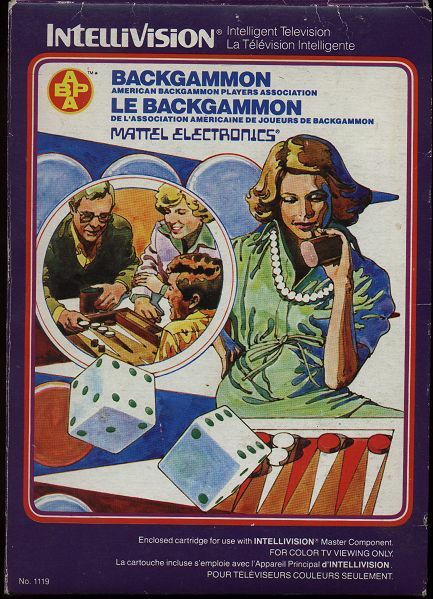 Box The Intellivision, Inc. white label version and 'sleeved' French-Canadian versions are quite rare. 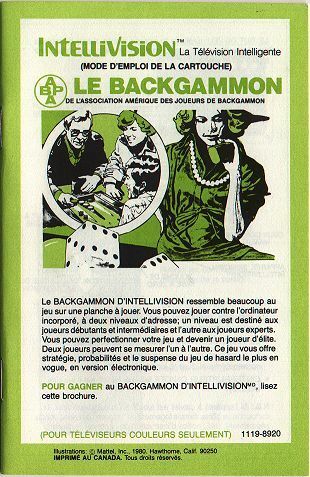 The standard French-Canadian version is uncommon as well. 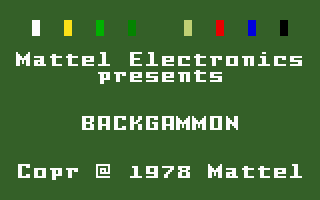 So far, seven variations have been found. 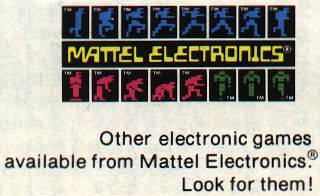 Manual Twelve variants have been identified. 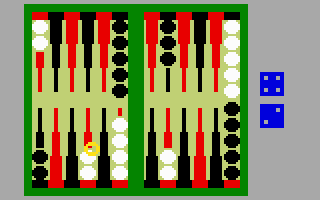 Overlays Versions with and without the ABPA logo are the primary difference. 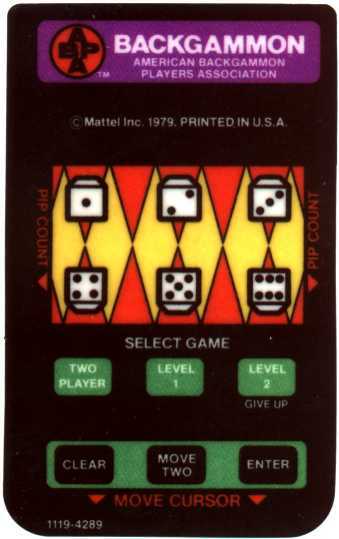 Two different overlay variations are known to exist. 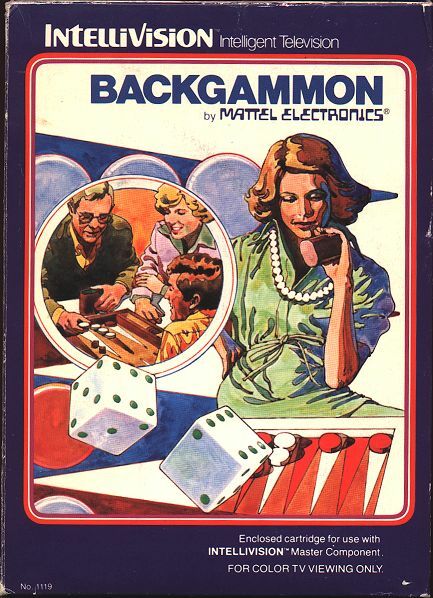 A total of seven Backgammon box variants have been documented. 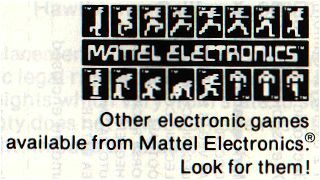 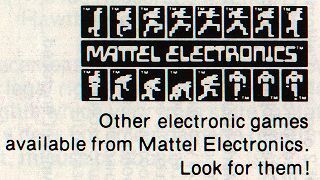 Mattel Electronics 1119-0910 1979 Hong Kong French-Canadian outer sleeve refers to original Keyboard Component; internally, same as standard 1119-0920 (Hong Kong); did the internal box vary? 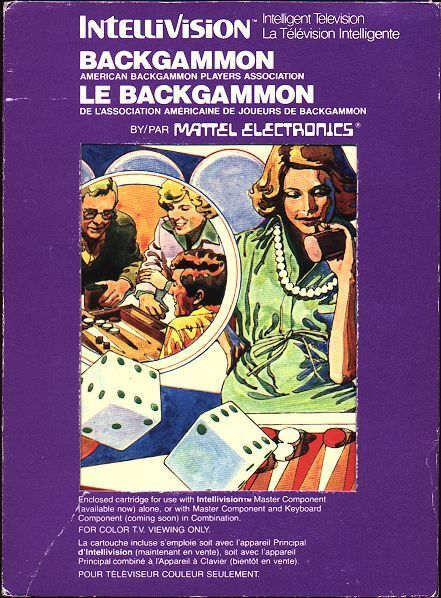 A total of twelve Backgammon manual variants have been documented. 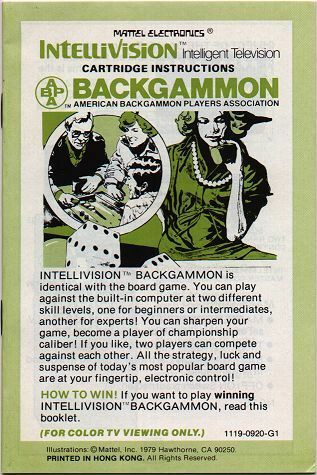 A total of two Backgammon overlay variants have been documented. 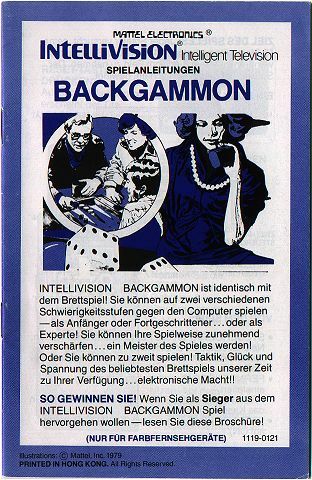 A total of three Backgammon label variants have been documented. 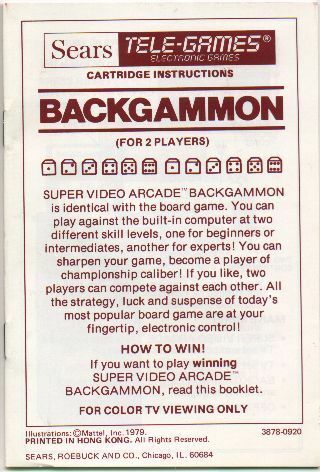 Not much to describe here. 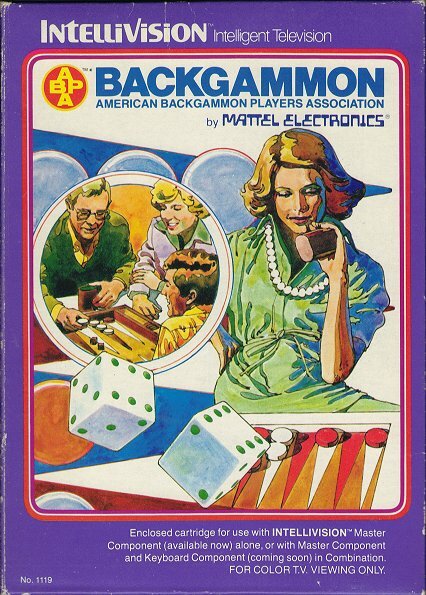 It's Backgammon!